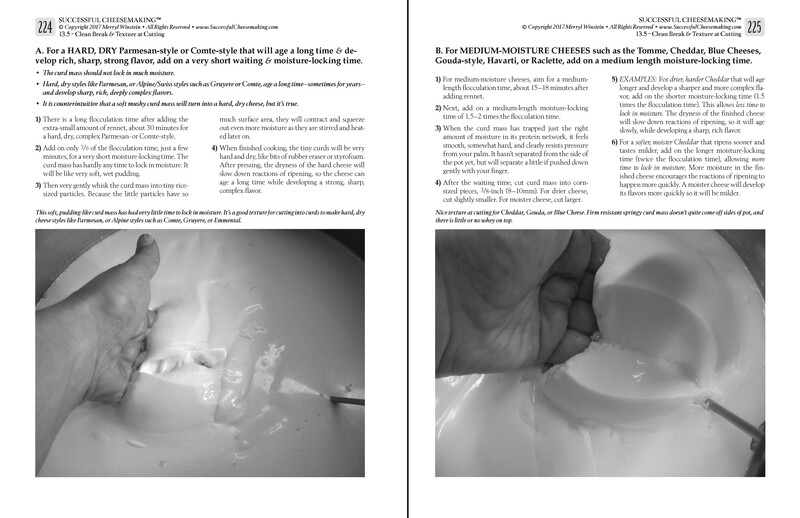 SUCCESSFUL CHEESEMAKING®, Step-by-Step Directions & Photos for Making Nearly Every Type of Cheese. Buy on this website directly from me. ACS conference attendees save $10 • View wholesale terms / purchase orders. 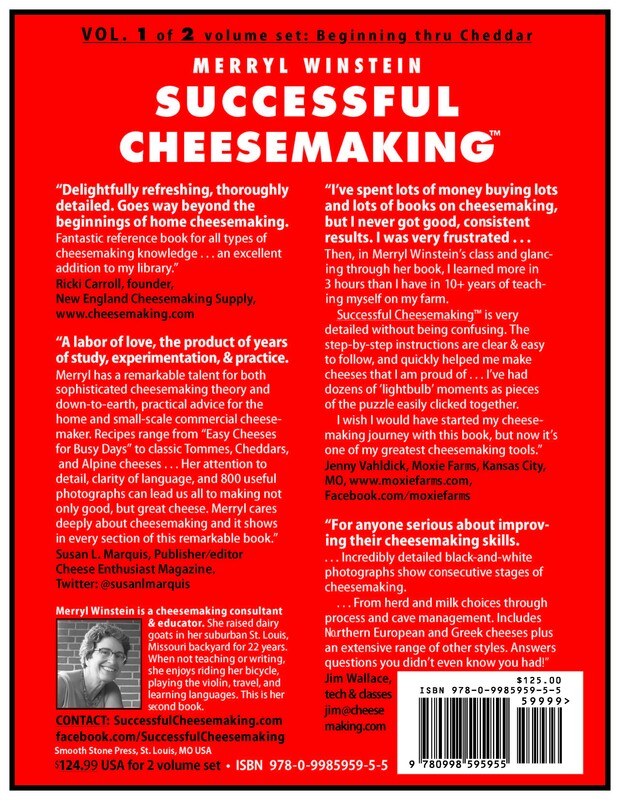 SUCCESSFUL CHEESEMAKING® answers more questions than any other cheesemaking book I know of. It finally answered most of my own questions. Wish I'd had a book like this when I first started. With 630 pages with 800 clear black-and-white photos showing every step, it's 2 big volumes, sold together as one set. 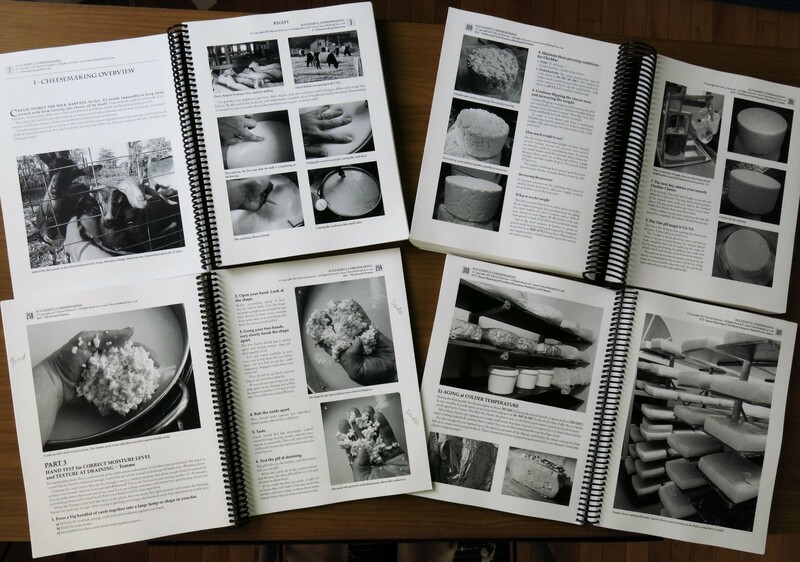 It's like an encyclopedia of cheese making. Hear about it, interview at KDHX.org, the Earthworms Show with Jean Ponzi. (KDHX_FM 88.1, St. Louis, MO, Nov 24, 2017). Publisher's Weekly Review, March 2018. Click here or scroll to bottom. Kirkus Review, July 2018. Click here or scroll to bottom. Please buy book here directly from me or send email for wholesale terms/purchase order info. Price: $124.99 for the set of two, FREE postage in USA. SAVE $30, two books: $219.98, FREE postage in USA. Europe: $65 postage for one book, $90 postage for two books. I’ve spent lots of money buying lots and lots of books on cheesemaking. I would read each book from cover to cover and try to follow the instructions. I made some OK cheese and some really awful cheese but I never got good, consistent results. I was very frustrated. Then, in Merryl Winstein’s class and glancing through her book, I learned more in 3 hours than I have in 10+ years of teaching myself on my farm. SUCCESSFUL CHEESEMAKING™ is very detailed without being confusing. 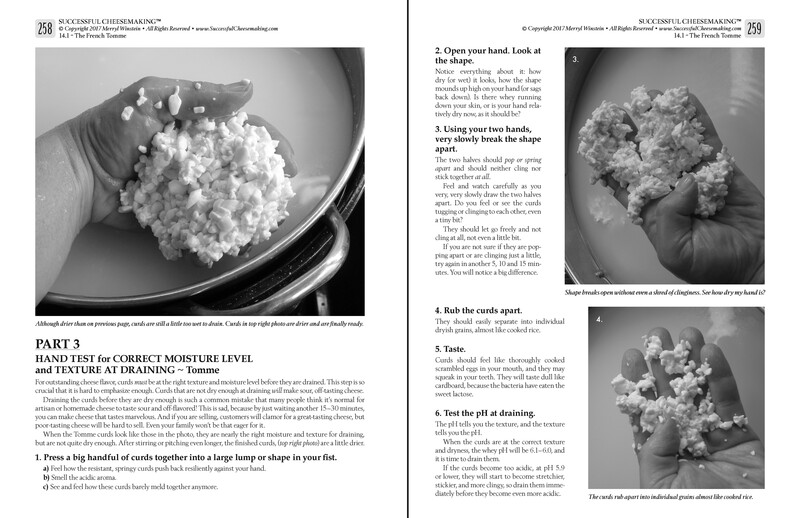 The step-by-step instructions are clear and easy to follow, and quickly helped me make cheeses that I am proud of. I’ve had dozens of ‘lightbulb’ moments as pieces of the puzzle easily clicked together. I wish I would have started my cheesemaking journey with this book, but for now, the two greatest cheesemaking tools I have on my farm are the wonderful genetics in my dairy cattle, and Merryl Winstein’s SUCCESSFUL CHEESEMAKING™ book. 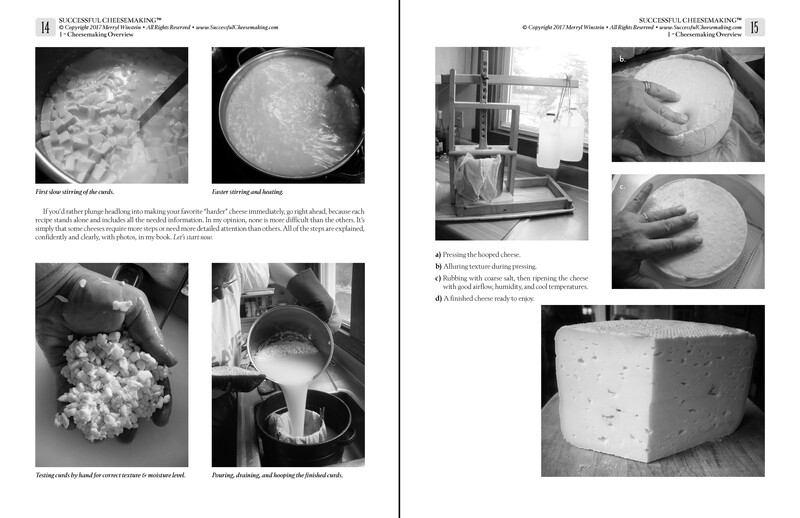 This book is a great addition to the library of anyone serious about improving their cheese making skills. In addition to a wealth of information on process and the “Why?” of it all, Merryl Winstein includes a very detailed section on several important Northern European and harder-to-find Greek cheeses, as well as an extensive range of other cheese styles. At over 600 pages, it’s not a quick read but well worth the time. Unique to this book are incredibly detailed black-and-white photographs showing consecutive stages of the cheesemaking processes. The book covers the range from herd and milk choices, through process stages, and cave management. With its wide scope, I certainly see this as a book to go back to time and time again. You will probably find that it answers questions you didn’t even know you had. . . Happy Cheesemaking! 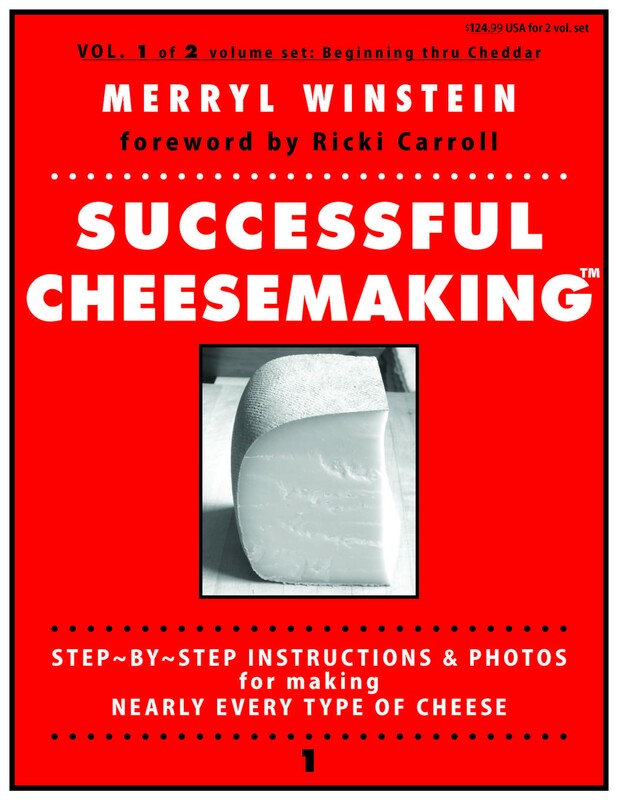 I am very happy to welcome the publication of Merryl Winstein’s SUCCESSFUL CHEESEMAKING ™ book. Indeed, it is not every day that such a book, international in its scope, deserves our attention as professional cheesemakers. 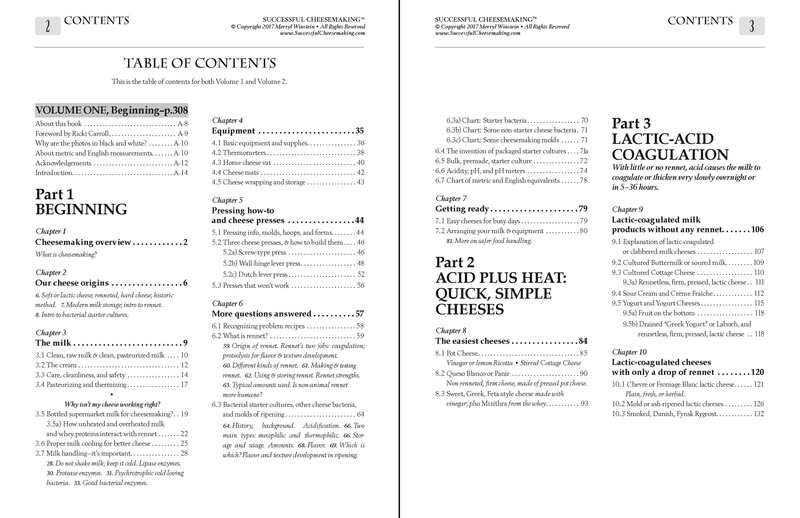 For this book is intended for home cheesemakers. Yet it deals with the theoretical as well as the practical aspects of its subject. In a readable and intelligible manner, she introduces the reader to the mysteries of cheese technology. Having travelled to Denmark on several occasions, and not least started learning the Danish language, she is well capable of transmitting her appreciation of the Nordic way of cheesemaking. This she does in a clear and confident manner. Moreover, her volume is both practical and helpful. Supported by hundreds of photographs, the book is clearly organized, well indexed, and logically structured. 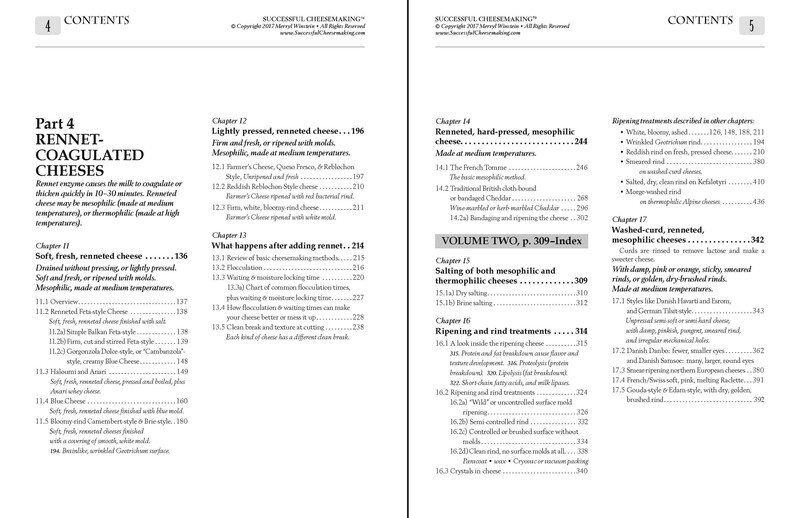 Not least it has a most helpful, practical, table of contents, an excellent starting point. This book will be used both by professional and home cheesemakers, to the benefit and enjoyment of both. Please buy book here directly from me, or email for wholesale terms and ordering by purchase order. Price: $124.99, FREE postage in USA. ANSWERS ALL YOUR QUESTIONS so you can make really great cheese! CLEAR, COMPREHENSIVE, ACCURATE, explains the traditional & professional ways of making the finest cheeses of cow's, goat's, or sheep's milk, using simple home or artisan equipment. 670 pages, 800 clear, step-by-step photos. 2 volumes sold together. Learn how and why the same milk & ingredients turn into an astounding array of completely different cheeses. Discover that each great cheese family is made with its own particular method (for example Cheddar, Alpine, lactic, washed-curd, stretched-curd, etc). Understand how varying methods change the flavor, texture, & ripening - make your cheeses turn out strong or mild, hard or soft, mold-ripened or plain. No amount of trial & error will lead to success if the directions you follow are wrong. This book shows how things really should go. Soon you'll be able to troubleshoot problems yourself. It's no harder to make great cheese than not-so-good, so get out your pots, equipment, & milk and begin a great adventure-down the cheese road! 670 PAGES, 800 PHOTOS. Durable, plasticoil spiral, lay-flat binding. Divided into 2 volumes sold together as one set. 25 pages of FAQs-Frequently Asked Questions. Glossary; references; further reading. Record-keeping charts. 30-page index. And much more! Please buy book here directly from me (Thanks! I earn more that way). Price: $124.99, FREE postage before Nov. 30, 2017. SAVE $30, two books: $219.98, FREE postage before Nov. 30. 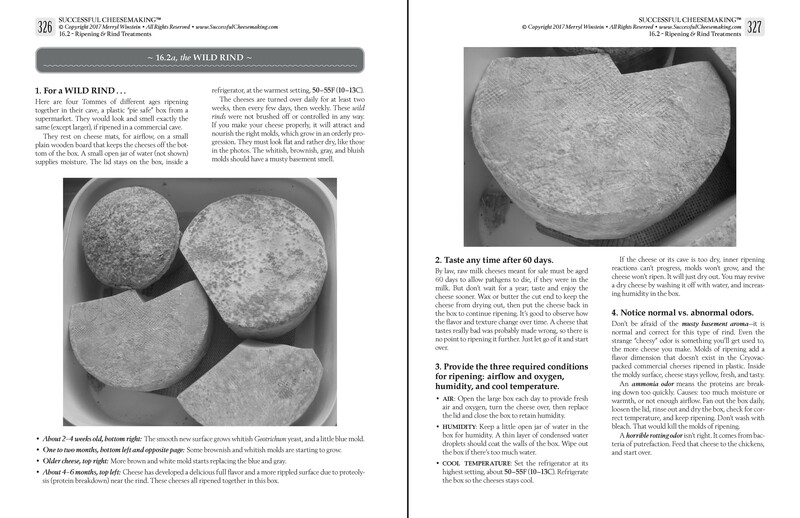 "A massive wealth of knowledge for dedicated cheese-making students." Winstein’s (also author of Your Fertility Signals, 1991) new two-volume work will teach readers how to make the cheeses they know and love—and probably some they’ve never heard of. The author first experienced fine cheese while traveling to Denmark as a teenager but didn’t try making it until many years later. In 1993, she took a one-day cheese-making class and was frustrated when she couldn’t replicate the strong tastes that she remembered. She began taking more advanced classes in Massachusetts and Vermont with a number of master cheese makers. In these volumes, Winstein hopes to convey the tips that she picked up from them in addition to her own knowledge from years of trial and error. Cheeses are helpfully grouped by order of complication to allow beginners to start small and then challenge themselves as they gain more experience. The photos in the book are in black and white; the author explains that monochromatic images show better detail about texture, that the ink will fade less over time, and that, in her opinion, the style is more aesthetically pleasing. The design is sparse and simple, with large pictures of each step. The recipes are very wordy, however, and color photos might have been preferable for readers who absorb information more readily from images or have poor vision. 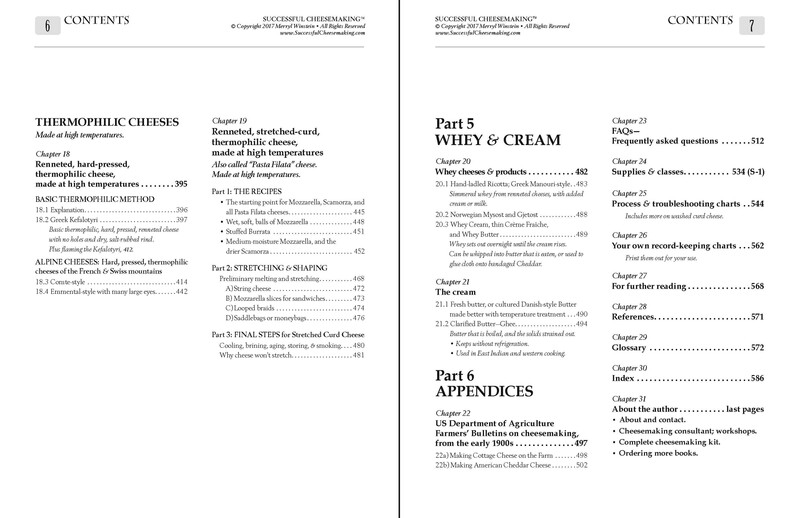 It’s possible that a reader may look at these texts and think that they contain much more information than they want about cheese making; however, the perspective of this book indicates that cheese is a precise undertaking and that if a person is truly hoping to make quality product, they’ll need to know everything here. In addition to recipes and an index of terms, there’s information about milk choice, starter cultures, rennet, cleanliness, safe cooking procedures, and equipment. It’s clear that the book is meant for people who are serious about taking on cheese making as a hobby or as a small business venture. Potential readers should also note that they may need to find a local source of raw milk, as Winstein explains that supermarket milk has limited functionality for cheese creation. A massive wealth of knowledge for dedicated cheese-making students. Cheese-lovers who want to try their hand at making their own taleggio, queso blanco, Brie, or Jarlsberg would do well to start with cheese-making consultant and educator Winstein’s outstanding two-volume collection of step-by-step recipes for producing some of the world’s classic cheeses at home. Those expecting a quicky recipe for DIY blue cheese or cheddar that comes together in 20 minutes would be best served elsewhere, but serious cheesehounds will find Winstein’s image-heavy, science-based tutelage to be useful. Specifics on aging, salting, ripening, and developing texture go a long way to instill confidence and ensure success for each type of cheese. Though Winstein does offer specific recipes for cheeses like havarti and burrata, she focuses more on broad styles, such as a basic kefalotyri, a classic Greek cheese, or Reblochon, instead of every variety of brie or Gorgonzola on the market. Those who’ve already made ricotta and mozzarella and want to learn more would do well to seek out this impressive work.